There’s a long history of all-in-one computers, dating back to the Apple LISA and the Macintosh in the early 80s. 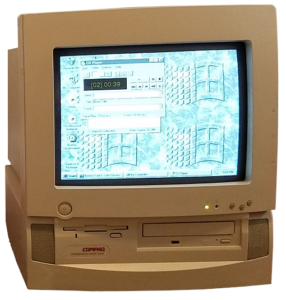 Here’s a 1994 version of an all-in-one PC compatible, the Compaq Presario CDS524. It’s in now way a comparison to modern-day AIO computers with the slim designs and flat panel displays, it’s bit, it’s heavy, it’s bulky. 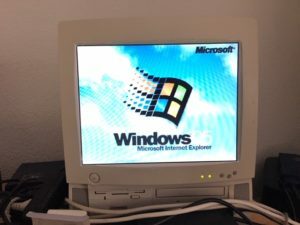 Still, as the concept survives to this day, the combination of the main computing unit and the display prooves that there was and still is a demand for all-in-one computers. By integrating the base unit and the 14″ CRT into a single enclosure, the footprint and cabling mess is greatly reduced. This has a drawback however: In contrast to a standalone CRT, there is simply no way to adjust the viewing angle of the display. Also, if the CRT broke you couldn’t simply replace it like an ordinary standalone screen. The CDS 524 was defintely targeted at space-constrained desks with multimedia-oriented consumers in mind, as it provided builtin audio, speakers, and a CD-ROM drive. There was even an optional TV tuner board available. With the included 320 MiB harddrive and the 486DX2 processor, the CDS524 was a quiet powerful mainstream computer. While it initially came with a meager 4 MiB of RAM, it can be easily upgraded to 64 MiB and was also a great companion for Windows 95. As I mentioned, one of the drawbacks of such a highly integrated computer, it’s no easy thing to replace the CRT on failure. Unfortunately, this is what happened to my unit. My bad luck was that I couldn’t get a replacement, or someone with expertise to fix the CRT. So after several months I eventually decided to do a blasphemic thing. I totally yanked out the CRT, and replaced it altogether with a modern TFT display. I had to do some soldering on the inside to rewire the internal VGA lines and the power supply, also some cutting and glueing on the front bezel to account for the flat panel display. There’s one good thing however: By removing the old CRT I got rid of the noisy fan as well. The CDS524 now runs absolutely silent.